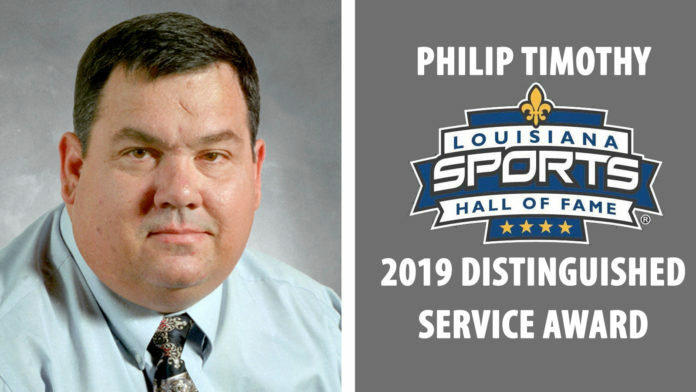 Deeply influential sportswriter Philip Timothy, a Northwestern State graduate and former Natchitoches Times sports editor, has been selected for the 2019 Distinguished Service Award in Sports Journalism from the Louisiana Sports Writers Association, and will be inducted in the Louisiana Sports Hall of Fame June 8. Timothy, who has won national, regional and state awards as a writer and editor, was greatly influential in the early stages of developing the Louisiana Sports Hall of Fame museum during and after his term (1998-2000) as the LSWA president. A 1976 NSU graduate who worked in the sports information office and was sports editor of the student newspaper The Current Sauce, he has over 40 years of sports writing and editing expertise to his credit. He will be honored alongside another 2019 DSA recipient, iconic Louisiana Tech broadcaster Dave Nitz, who is in his 44thseason as the radio voice of Bulldog sports. Nitz has called nearly 3,000 football, basketball and baseball contests and events for the Bulldogs and Lady Techsters. He’s done 36 seasons of minor league baseball, including play-by-play for franchises in Shreveport and Baton Rouge. The honor, to be made official June 8 in Natchitoches, means Timothy and Nitz will be among the elite 11-person Class of 2019 being inducted in the Louisiana Sports Hall of Fame. Nitz and Timothy and Nitz were selected from a 24-person pool of outstanding nominees for the state’s top sports journalism honor. Distinguished Service Award winners are enshrined in the Hall of Fame along with the422 current athletes, sports journalists, coaches and administrators chosen since 1959. Just 62 leading figures in the state’s sports media have been honored with the Distinguished Service Award since its inception 37 years ago in 1982. Nitz and Timothy will be among the 2019 Louisiana Sports Hall of Fame Induction Class to be spotlighted in the annual Induction Dinner and Ceremonies on Saturday evening, June 8, at the Natchitoches Events Center. The Induction Dinner and Ceremonies are the highlight of the 2019 Induction Celebration beginning Thursday afternoon, June 6, with a regionally-televised (Cox Sports Television) press conference at the Hall of Fame museum at 800 Front St. in Natchitoches. Five-time NFL Most Valuable Player Peyton Manning and former LSU football coach Les Miles, who won 77 percent of his games and a national championship in 11 seasons with the Tigers, join five-time USA Olympic volleyball standout Danielle Scott-Arruda among a star-studded group of eight 2019 competitive ballot inductees chosen for the Louisiana Sports Hall of Fame. In his 57thseason as a broadcaster, Nitz works in a booth named for him at Joe Aillet Stadium in Ruston. In 2011, he was a Louisiana Tech Athletics Hall of Fame inductee and also was chosen as Louisiana Sportscaster of the Year. The 2019 Induction Celebration will kick off Thursday, June 6, with a press conference and reception. The three-day festivities include two receptions, a youth sports clinic, a bowling party, and a Friday night riverbank concert in Natchitoches. Tickets for the Saturday night, June 8 Induction Dinner and Ceremony, along with congratulatory advertising and sponsorship opportunities, are available through the LaSportsHall.comwebsite.